Lovely Review from the Globe and Mail! Wow... this was a very nice way to start the day! 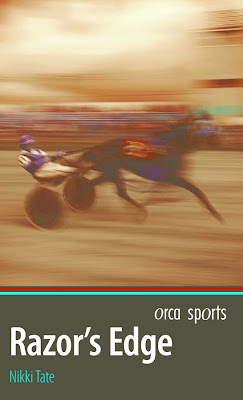 Razor's Edge is fun to read because the teenage boys in it are forced to confront very difficult situations at Blackdown Park, where they own Three Muskateers, a team of Standardbred harness racing horses. The friends have scraped some money together and organized their time efficiently enough to have their own little racing business, and to go to school. Their days start before sunrise at the stables and end well after sunset: There is no end to the tasks associated with trying to realize their dream. But that dream gets derailed when it is clear someone is stealing precious things from the stables, the horses don't perform as well as the boys hope, they're not making any money and narrator Travis finds that making out with Sassy feels better than hanging out with his best friends/business partners. Add a serious bout of racism as Jasper, the one partner who is First Nations, gets accused of being a thief, plus fist fights between best friends, domestic violence and alcoholism, and you have the lives of way too many kids. Author Nikki Tate writes a flawless teenage tale. There is no black, no white; just, as is the case in life, only shades of confusing and complicated grey wound around hearts and hormones. Remind you of anyone? What teenager won't have to confront a broken heart and a dream changed to nightmare because of poverty and domestic violence? How timely this novel is as the latest report from Campaign 2000 tells us one in 10 children in Canada lives below the poverty line. Even though Tate gathers up the loose ends in the final chapter, we see that some characters will understand life in a deeper and more meaningful way while others will become the collateral damage. Tate offers hope and sadness, not as a solution but as reality. Go to a used clothing store and choose a piece of clothing that you are drawn to or repelled by. Wear the item and a channel a poem from it. Given the treasures we found (my bowling shirt reads, "Bowl to Keep in Shape"), it's pretty obvious that our poems were going to be very different! Feeling like a challenge yourself? Have a look at the P&W website and have a go - you never know what might you might come up with! Though things have been quiet over here on this blog, the Dark Creek Chronicles farm blog has been busy, busy, busy. I supposed part of that has to do with the fact that fall on the farm is crazy busy, so there's always stuff to write about. And, maybe it's easier to write about life on the farm than it is to come up with something new to say about the writing of books biz. Razor's Edge is out (yay!) - and, despite the oddness of the cover colour when I upload the image, it matches Venom very nicely in real life. There should have been a third book to round out the set, but you know me and trilogies - I can't seem to count to three. And by the way, for readers who send nasty letters suggesting ways they'd like to see me suffer for my crime of not yet having finished the third of the Estorian Chronicles series, your names have been duly noted. Watch for yourselves in a torture chamber in a future book. As for Jo in that other series without a conclusion, rest assured she is doing well up in Barkerville, making way more money than I am here. As for the most recent missing third volume, Broken, nothing about that book is proceeding as per the plan. And that includes the title, which is no longer Broken but is now either Awake Enough to Know or maybe Unintended Consequences or perhaps Some Kind of Normal or possibly Lifting the Weight. Not only does the book no longer have a title, it has morphed from a short, upbeat, straightforward member of the Orca Sports series for reluctant teen readers into a full length, stand-alone, terribly depressing novel that has been taken over by a character meant only to be peripheral to the plot... Sigh. How does this happen, I ask you? Is the author not supposed to have some kind of control over this process? The good news is that the manuscript has not been tossed by Orca and, instead, has found a new place in a completely different section of the catalogue. I have the latest draft back and am about to launch into another rewrite. This, though, will wait until after I have feasted (tomorrow, we're doing our turkey dinner early) and gone sailing (on my brother's new sailboat on Sunday, hence the early turkey). After that, I should feel like I've had a bit of a holiday and should be able to return to work fortified. The most interesting thing about working on this book is how utterly miserable it has been spending time inside the head of a severely depressed teenager. I will be so very glad when the project is finished and I can turn my attention back to something a little more ... chirpy. To all you Canucks out there, have a great Thanksgiving weekend! 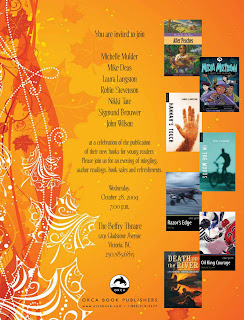 A lovely mini-review written by Barbara Julian appeared in yesterday's Times Colonist... Though, I'm not exactly sure how to interpret the bit about the plot being irrelevant - or, less than captivating - or, something. I've decided not to dwell on that too much and, instead, appreciate the positive vibes and kind words. I do hope this book finds a place with reluctant readers and, perhaps, makes them a tiny bit less reluctant? Tate is expert at packing a mass of description into simple but fluent language for the reluctant reader. The right reader for this book will have no reluctance about horses, however, and Tate's followers will find what they have come to expect in this latest of her equine adventures. 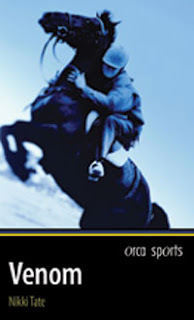 Part of Orca's "high interest sports action" series, this tale about teens more keen on horses than school is captivating less for the plot than for the rich description of the horse mind and body, of racing action and of the minutiae of life on the exercise field and in the barns. New Book on its Way! Razor's Edge is due out any minute. 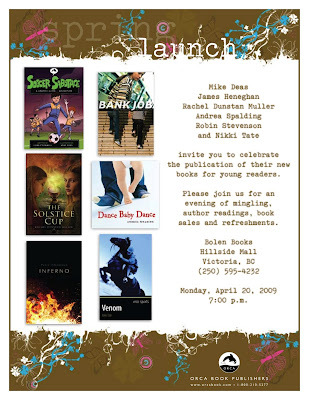 Come help celebrate the arrival of the new book at one of these events... And, if you aren't interested in Razor's Edge - no problem. 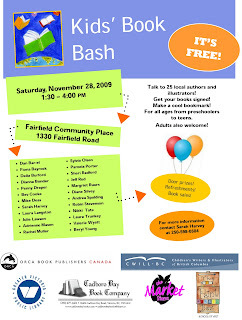 Both events have plenty of other, much cooler authors and their way cool new books so you don't have to bore yourself just talking to l'il ol' me. This wasn't where we were supposed to wind up yesterday! Poor Dani had an unfortunate landing when dismounting during a vaulting demonstration at Metchosin Days. After being tended to by several lovely firemen, including one on whom she unceremoniously threw up, we headed off to the Victoria General Hospital for an X-ray. The good news is the bones are intact. The bad news is that the sprain is so bad she has to wear an air cast for SIX WEEKS!! This is rotten news, indeed, as the big provincial vaulting competition is coming up this weekend in Chilliwack. we spotted one, two, three deer trotting along Quadra Street! The third one was just behind these two fellows. Just after we passed, the three adventurers headed across the street, halting traffic in both directions. All crossed safely and we proceeded directly to Cafe Brio on Fort Street. Oh my, what a glorious meal that was! Should you ever have a chance - GO! My sister's horse arrived here from Calgary a few days ago. Dinny (formerly known as Danny, but that's way too confusing given we already have a Dani in the household...) will be here for the summer so my niece, Cyd can enjoy some mellow riding and a couple of horse shows when she comes to visit. On the subject of horse names (and re-names), Bonny was also called Danny when we bought her. What are the chances? Whatever his name, the handsome, quiet Hafflinger is happy as pie here on the farm - and we are happy as pie to have him here. We took a ride down the Lochside Trail and he was perfectly behaved. Such a pleasure to ride a horse who does not have a bicycle phobia! Here's how my feet have spent the better part of the last several days... Meanwhile, the rest of me has been tiling the upper part of the new shower stall, installing the new ceiling panel, fixing the ceiling fan, installing the new light fixture... Is it any wonder my calves ache? About a month ago (or so) Dark Creek Diego joined our herd... Diego is a 10 year-old Appaloosa who is strangely sane... As in, he isn't freaked out by bicycles (unlike Bonny! ), doesn't feel compelled to explore the world mouth-first (unlike Brio), and is actually quiet and thoughtful under saddle (though, Ringo is getting there...) What a pleasure to have an actual pleasure horse around the place! Here's the proposed cover design for the new Orca Sports title, Razor's Edge. What do you think? Alas, the spot we decided would be perfect for our new stand of giant timber bamboo was a tangle of blackberry canes. Bring in the goats! The crew (including Nosmo) was happy to oblige. The brambles have now been cleared and the giant bamboo planted. Not that the bamboo is particularly huge - yet. It looks rather weedy, actually. But, given our experience with the golden bamboo grove and our modest stand of black bamboo, we know that a little time will take care of everything. Before long, we will be building a new house with our massive, fast-growing timbers! First duck eggs (found another in the orchard!) and now Kashmir underfluff. I'm sure there is a more technical term for the super-fine undercoat the Kashmir goats are shedding. We've found the dog shedding blade-comb-thingy to be extremely effective in teasing out the loose undercoat. This year the harvest is much better than last. Next on the list of equipment to acquire is a spinning wheel... not long after that, socks! Beekeepers! To look after the new bees, of course! Said bees are scheduled to arrive in about six weeks. Which means we need to get cracking on hive assembly, etc... Bring on the honey! Because what our farm really needs is ducks... five of them, to be precise. Meet Henrik, Daniel, Welly, Baby, and Beauty. Ringo (in the background) was fascinated by the new arrivals. (I know the title says Runner Ducks, but they are actually Indian Runner Ducks crossed with mallards... which gives the males a more interesting colour and all of them less upright postures. Arrived back from a whirlwind 11 days travelling to Rancho Murieta with Karen Brain and her horse, VDL Odette. Karen was competing at the Golden State Dressage Festival, continuing to develop and train her horse with an eye to qualifying for the World Equestrian Games para-dressage competition next year. What a great trip - the weather was excellent (except for that wind/sand storm!) and it was way cool to see all those high level dressage horses tootling about. At various points I was tasked with taking Miss Odie out to graze. The grass was lush, the sun warm, the horse happy... Life, as they say, is good! Venom is out! It's always pretty exciting when the box of author copies arrives in the mail. Venom might not be my first book, but it is a book of firsts. 2. First high interest, low vocabulary book I've done for a teen audience. me in some new direction. 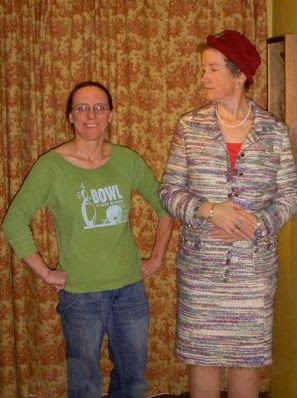 I have to say this was rather fun, being interviewed by a character in a book. Darby is a rather precocious character - she has her own blog and seems to have pretty good control of her author, kc dyer. Check out her blog to see how Darby handles several interviews. I particularly like the disguises the authors wear to try to hide their true identities! While you are over at Darby's virtual place, be sure to enter your name in the comments so you have a chance at winning a free book. Good luck! Well, crisis in my blogosphere, anyway. I blame Facebook, Twitter, and Librarything for the complete lack of action here at Work in Progress. And, I confess, the blog is suffering from a bit of an identity crisis. I think the plan initially was to chronicle the day-to-day life of a writer, but I discovered that the life of a writer is actually pretty boring. Essentially, every day is the same. 1. Thing of something to write about. 2. Chain myself to computer until something is written. 4. Get depressed about #3. 5. Go back to computer. Write some more. 6. Print out what has been typed. 7. Scribble all over typing. 9. Repeat ad nauseum until the mail arrives again the next day. 10. Get depressed all over again. 11. Take occasional breaks to show up at bookstore signings where immediate family members outnumber legitimate fans. Pretend this doesn't bother you. 12. For fun, muck out the horse paddocks. Sigh. Is it any wonder I have been having some trouble mustering the urge to blog?